If you find yourself stuck on what coffee to order, you're not alone. In fact, there are more than 30 different types of coffee drinks out there today! Just head into your local cafe and you'll be spoilt for choice with the coffee menu! But, with so many coffees on offer, how do baristas keep on top of things? There's cup size, milk portions, espresso size and more that they need to constantly be thinking about. We think we need a coffee just thinking about it! 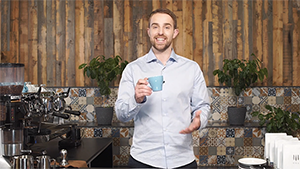 Don't miss Hugh Kelly's previous course on Espresso Coffee Fundamentals. Any budding barista knows that making the perfect cup up coffee is anything but easy. Precision, technique, and thought go into every cup that is presented to a customer. It may sound stressful, but with the help of Australian Barista Champion (2016 & 2017) and World Barista Champion Finalist (2017), Hugh Kelly, budding baristas can make any espresso drink in no time. With more than 10 years' of experience on the coffee scene, Hugh has expert knowledge about how to create the perfect cup of coffee. He has worked as Head Barista at ONA Coffee House, ran the coffee bar at The Cupping Room, developed the training department for ONA Coffee and now runs the research and development side of ONA Coffee. In this course, he will show you how to create some of the most popular espresso drinks including the latte, cappuccino and, macchiato. If you're a budding barista or need a skills brush up, look no further. Hugh's expert tips will see you whipping out perfect espresso drinks!